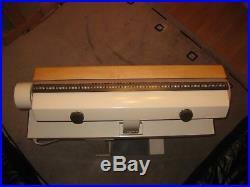 For sale rotary ironing machines Privileg/Piccolo/Cordes 834 (part of Miele nowadays). There’re several identical units with difference being colours white vs. Beige so you will get either of those. GREAT FOR IRONING OF YOUR BEDDING, TABLE CLOTHS, TOWELS etc. Appliance is in good technical and visual condition with only cosmetic marks commensurate with age like some paint scratches, spots or plastic elements cracks etc not affecting the work in any way. Privileg / Piccolo are rebranded name for the Argos equivalent market. This unit has a little plastic bit holding the table upright cracked off but the machine works. Just don’t put any extra weight on the table left side. Otherwise works just fine. Please fill free to ask any question and see also my other listings for choice of machines. Total power intake – 3075W. Heating/ironing power intake – 3000W. Rotate/press motors’ power 80W. Detachable wrist support board and rod for the ironed cloths to hang on. Wheels allow you move it to a storage when not needed. New cloth will be fitted or provided. D 40cm, W 100cm, H 95cm. Roll diameter – 15cm, roll length 85cm. Heat up time – up to 5 minutes – just choose your temperature (single, double, triple dots as in regular old fashion irons) when thermostats heat the plate enough theres an intense ticking so just start ironing. Light moist fabric allowed – YES – works much better with moisturised fabrics, but do not use it as a fabric dryer!!!!! To use it switch it on set the temperature up, and when ready put the end of the fabric on top of the roll just under the heating plate and press the foot pedal which moves the heating panel towards the roll and starts rolling it. The fabric is being automatically fed in with the roll turning. Please, know the fabric type. Nowadays cottons are very often mixed with polyesters or other cheap stuff which can melt or at least cripple in the higher temperatures. ALL EMBROIDERY, PLASTIC BUTTONS, ZIPS, LABELS MUST NOT TOUCH DIRECTLY THE HOT PLATE AS THEY MAY MELT leaving smudges on the plate itself and make your garment permanently dirty. THEY MUST BE THEN FACING DOWN TO THE ROLL Have seen it done so but one of my customers before. He had to scratch it very gently off the plate once the machine cooled down so really – IT IS NOT A TOY BUT A HOT MACHINE WHICH MUST BE KEPT AWAY FROM CHILDREN. Releasing the foot pedal allows you to take out your garment which once ironed ends up on the table under the roll. Temperature adjustment depending on the fabric type from curtains, nets, wool, to cottons, linen etc. Very easy to use. Once you get familiar with it you can iron virtually everything including shirts. ALL WORKS CAN BE CARRIED IN A SITTING POSITION so if you spend ages ironing why not to do it sitting… Whilst doing ie children clothes you can put more then 1 piece of garment in a single go – ie 2 pairs of kids shirts, trousers etc. We can also deliver for the cost of petrol :. PHYSICAL DAMAGE CAUSED DURING OWN CARRIAGE CANNOT BE COVERED BY THIS. I will be happy to answer any questions. This ironer is not a toy! To avoid the risk of accidents and damage to the ironer please read these instructions carefully before using it for the first time. They contain important information on its safety, use and maintenance. Keep these instructions in a safe place and ensure that new users are familiar with the content. Pass them on to any future owner. 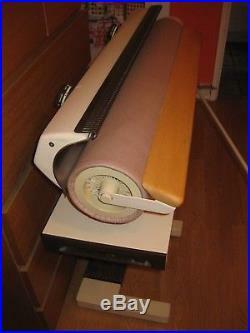 This ironer must only be used for ironing articles which were washed in water and which have a care label stating that the article is suitable for machine ironing. This ironer is not intended for use by persons (including children) with reduced physical, sensory or mental capabilities, or lack of experience or knowledge, unless they are supervised whilst using it or have been shown how to use it correctly by a person responsible for their safety. Technical and electrical safety. Before setting up the ironer, check it for any externally visible damage. Under no circumstances should you use it if it has been damaged. A damaged appliance may be dangerous. If the supply cord is damaged, it must be replaced by an approved service technician to avoid a hazard. If in any doubt, consult a qualified electrician. The electrical safety of this appliance can only be guaranteed when continuity is complete between it and an effective earthing system which complies with current local and national safety regulations. It is most important that this basic safety requirement is present and regularly tested, and where there is any doubt the household wiring system should be inspected by a qualified electrician. This ironer complies with all relevant local and national safety requirements. Repairs should only be undertaken by an approved service technician. Ensure device is not supplied to the mains until after maintenance or repair work has been carried out. Faulty components must only be replaced by genuine original parts. The ironer is only completely isolated from the electricity supply when. It is switched off at the wall socket and the plug is withdrawn, or. It is switched off at the mains, or. The screw-out fuse is removed (in the UK and other countries where this is applicable). Do not damage, remove or bypass the safety features, fixtures and control elements of this ironer. Any removable outer panels must be in place, and all moving or electrical parts shielded before the ironer is switched on. This ironer may only be used in mobile installations such as ships if a risk assessment of the installation has been carried out by a suitably qualified engineer. When working with the ironer always wear close fitting clothes. Wide sleeves, apron straps, scarves and ties etc. Could be taken in by the roller. Remove any rings, bracelets, or other jewellery before starting to work. Tie back long hair. When heated up there is an acute risk of burning: if the heating plate is touched. 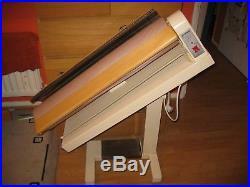 If the foot pedal is pressed down while fingers or hands are positioned between the raised heater plate and the roller. To avoid the risk of injury do not let children play on or near it, or with the controls. Supervise children whilst you are using it. Do not drape laundry over the heater plate when it is heated up. This is a fire hazard. Use the swing out bar. It is designed for hanging laundry on. After use it should be swung back out of the way. Take care not to press down on the bar when it is swung out. There is a danger that this could tip the ironer over. Switch the ironer off before removing the plug from the socket. Do not pull it by the cable. Do not connect the ironer to the mains electricity supply by a multi-socket unit or an extension lead. These do not guarantee the required safety of the appliance e. Do not lay the connection cable over the heater plate when it is heated up. This could damage the cable -danger of electric shock. Use the cable holders on the ironer to wind the cable away. 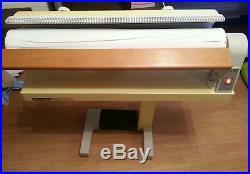 The item “Rotary ironing machine Cordes 834/Piccolo 85cm wide, foldable” is in sale since Tuesday, October 2, 2018. 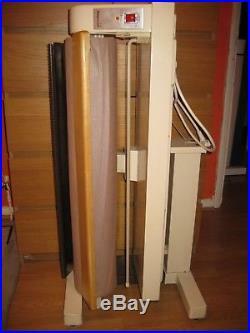 This item is in the category “Home, Furniture & DIY\Appliances\Ironing & Vacuuming\Irons”. The seller is “meliameli” and is located in Wokingham, Berkshire. This item can be shipped to United Kingdom, Austria, Belgium, Bulgaria, Croatia, Cyprus, Czech republic, Denmark, Estonia, Finland, France, Germany, Greece, Hungary, Ireland, Italy, Latvia, Lithuania, Luxembourg, Malta, Netherlands, Poland, Portugal, Romania, Slovakia, Slovenia, Spain, Sweden, Australia, United States, Canada, Brazil, Japan, New Zealand, China, Israel, Hong Kong, Norway, Indonesia, Mexico, Singapore, South Korea, Switzerland, Taiwan, Thailand, Saudi arabia, South africa, United arab emirates, Ukraine. 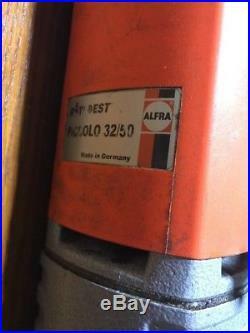 Alfra Rotabest Piccolo 38/50 X Magnetic Drill Machine (110v). Please study the images to make sure an item will meet your expectations. All pictures are of the actual item. Holiday from 04/08/2018 to 22/08/2018. The item “Alfra Rotabest Piccolo 38/50 X Magnetic Drill Machine (110v)” is in sale since Friday, August 3, 2018. 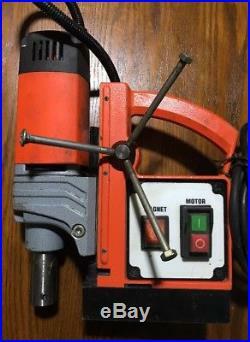 This item is in the category “Business, Office & Industrial\Industrial Tools\Drilling Tools\Drills”. The seller is “saumartus-0″ and is located in Romford. This item can be shipped to United Kingdom, Austria, Belgium, Bulgaria, Croatia, Cyprus, Czech republic, Denmark, Estonia, Finland, France, Germany, Greece, Hungary, Ireland, Italy, Latvia, Lithuania, Luxembourg, Malta, Netherlands, Poland, Portugal, Romania, Slovakia, Slovenia, Spain, Sweden, Australia, United States, Canada, Brazil, Japan, China, Israel, Hong Kong, Norway, Indonesia, Malaysia, Mexico, Singapore, South Korea, Switzerland, Taiwan, Thailand, Chile. 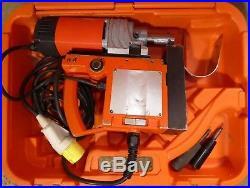 Alfra Rotabest Piccolo 38/50 X Magnetic Drill Machine (110v). Please study the images to make sure an item will meet your expectations. All pictures are of the actual item. The item “Alfra Rotabest Piccolo 38/50 X Magnetic Drill Machine (110v)” is in sale since Monday, July 9, 2018. 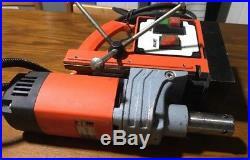 This item is in the category “Business, Office & Industrial\Industrial Tools\Drilling Tools\Drills”. The seller is “saumartus-0″ and is located in Romford. This item can be shipped to United Kingdom, Austria, Belgium, Bulgaria, Croatia, Cyprus, Czech republic, Denmark, Estonia, Finland, France, Germany, Greece, Hungary, Ireland, Italy, Latvia, Lithuania, Luxembourg, Malta, Netherlands, Poland, Portugal, Romania, Slovakia, Slovenia, Spain, Sweden, Australia, United States, Canada, Brazil, Japan, China, Israel, Hong Kong, Norway, Indonesia, Malaysia, Mexico, Singapore, South Korea, Switzerland, Taiwan, Thailand, Chile. 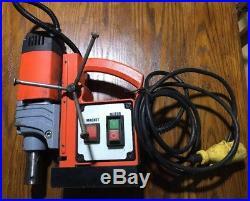 Alfra Rotabest Piccolo 32/50 Magnetic Drilling Machine 110V. The Alfra Rotabest Junior is capable of drill up to 32mm in both long and shocutters. 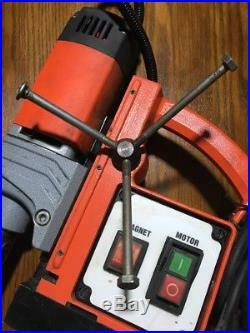 It has adjutable motor head to allow for standard twist drills. Core Drill 12 – 32mm. Cutting Depth 25 or 50mm. Twist Drill 1 – 13mm DIN 338. Countersinking 10 – 40mm. Capacity 1050 Watts. 1-speed gearbox 400rpm. Arbor 19mm Weldon Direct Arbor. Coolant Supply Integrated, automatic. Magnetic Adhesion 8,000N. Magnet Foot 70 x 160mm. Weight 10.60kg. Comes with not original handle made of three long bolts, please see pics. In full working order and very good condition. The item “Alfra Rotabest Piccolo 32/50 Magnetic Drilling Machine 110V” is in sale since Monday, February 19, 2018. 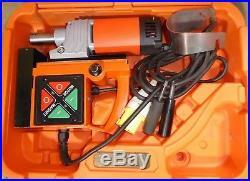 This item is in the category “Home, Furniture & DIY\DIY Tools\Power Tools\Corded Drills”. The seller is “heyniv-luh” and is located in Milton Keynes. This item can be shipped to United Kingdom, Austria, Belgium, Bulgaria, Croatia, Cyprus, Czech republic, Denmark, Estonia, Finland, France, Germany, Greece, Hungary, Ireland, Italy, Latvia, Lithuania, Luxembourg, Malta, Netherlands, Poland, Portugal, Romania, Slovakia, Slovenia, Spain, Sweden, Australia, United States, Russian federation, Canada, Brazil, Japan, New Zealand, China, Israel, Hong Kong, Norway, Indonesia, Malaysia, Mexico, Singapore, South Korea, Switzerland, Taiwan, Thailand.